There are two types of windings usually used in a transformer. The winding receiving electrical energy is known as primary winding, whereas the winding delivering electrical energy is called secondary winding. Windings are usually made of high grade of copper. Standard conductors are used for carrying higher current. To avoid the each turn to come in contact with each other, the windings are provided with insulation. In addition to inter-turn insulator, bare copper wires are provided with enamel coating. Usually single- or double-layer cotton is used. Sometimes press board or cotton insulation is also used to support the windings. Usually additional insulation is provided for line end turns for their protection from lightning and switching over voltages. During transient disturbances, the distribution of voltage is not uniform along the windings and 80 per cent of voltage at that time appears across the first 10 per cent of turns from line end. Heat generation occurs due to energy loss, which is proportional to the volume of the material in which the losses occurs. The heat dissipation is proportional to the surface area of the same material and the tank. The ratio of heat generated to heat dissipated is approximately proportional to the ratio of volume of the material for conductors and the core to the surface area of the material for conductors, the core and the tank, which must approach to unity to limit the temperature rise. This can be achieved by corrugating the surface area of the tank. To get effective cooling, the radiators are used shown in Figure 1.18 later on. The windings must be economical. The heating conditions of the windings should satisfy standard requirements. The windings must have good mechanical strength to combat the force that originates due to short circuit. The windings must have the necessary electrical strength during over-voltage. 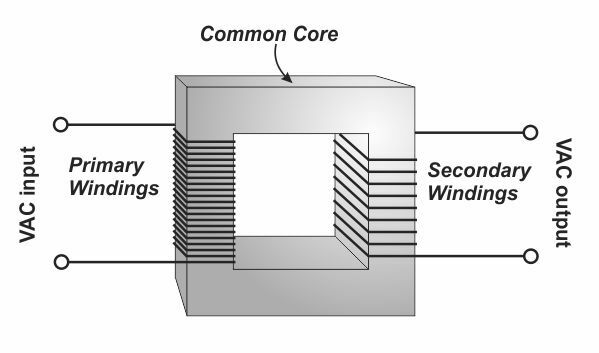 The following are the two different types of windings: (i) Concentric windings and (ii) sandwich windings.